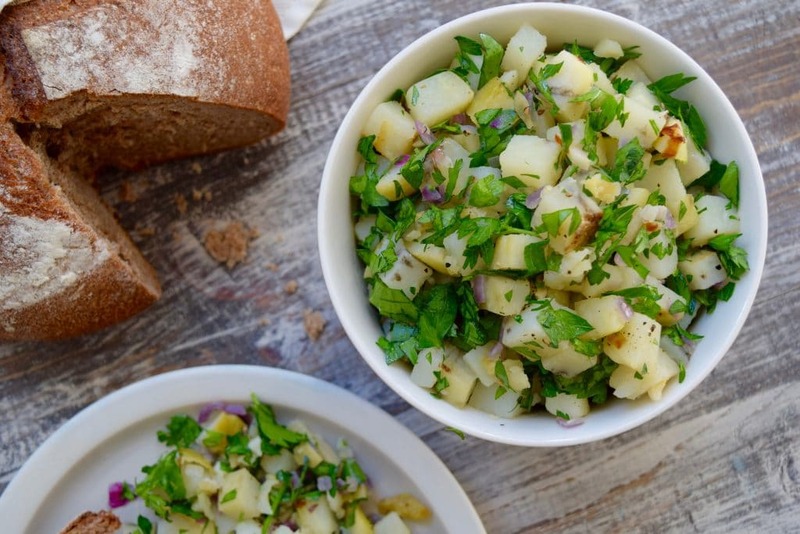 Skip the mayo and pile on the herbs with this Moroccan version of Potato Salad. Potato salad – some love it, some hate it. Either way, this Moroccan spin on a family favorite is healthier and way more delicious. Almost all classic potato salad recipes call for tons of mayonnaise- which, if you know me by now, I’m not a fan of. So I decided to whip up this healthier version that’s free of mayo. This Moroccan twist can be eaten in place of hash browns or toast for a weekend brunch, or serve it as a dinner side dish. “Potatoes have health benefits? !,” you may be wondering, since potatoes are often demonized as an unhealthy food. The Harvard Healthy Eating Plate doesn’t even allow you to count them towards your vegetable servings. Ouch. The reason potatoes have a bad rap, at least in part, is because they have a high glycemic load and raise your blood sugar significantly when eaten on their own. A blood sugar spike is something you want to avoid. Constantly putting your blood sugar on a roller coaster from high glycemic foods is associated with weight gain, obesity, diabetes, and inflammation. Additionally, the way potatoes are often consumed – fried into french fries or potato chips – isn’t healthy. But whole potatoes themselves actually offer quite a bit in terms of nutrition… and a lot more than any sort of processed food! Now of course you can get the nutrients below from other, even more nutritious and lower glycemic vegetables, but, if you (or someone in your family) is a veggie-phobe, they could be a decent source of nutrition, and a good gateway in to eating more plants. Protein: One large baked potato with the skin (299 g) offers a decent 7.5 grams of protein. Not bad for a vegetable. Minerals: In addition to vitamins, potatoes are a source of minerals, including: Iron (18% DV), Magnesium (21% DV), and Potassium (46% DV). Stay tuned for another post on how to prepare potatoes to make them healthier! In the meantime, here is the recipe. A delicious guilt-free potato salad. Place new potatoes in a pot of cold salted water. Cook over medium-high heat until tender, about 20 minutes. Drain potatoes and cool. If using organic potatoes, leave skin on, otherwise peel potatoes, then chop into cubes and place in a mixing bowl. Add parsley, red onion, garlic, and olive oil, and mix well. Season with salt and freshly ground black pepper to taste. Serve at room temperature. Why should we leave the skin on organic potatoes and not peel them? Surely the skin of an organic potato gets dirty too?